Who doesn’t love balloons, especially if they are heart-shaped! Hello everyone! 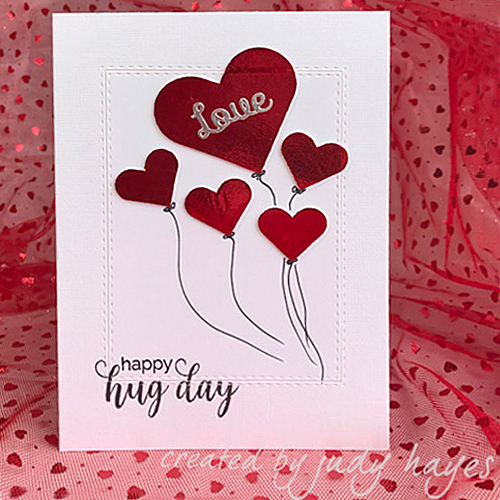 It’s Judy here today with a Love Balloons Card created with 3D Foam Hearts and red foil from 3D Foam Holiday Embellishment Kit. 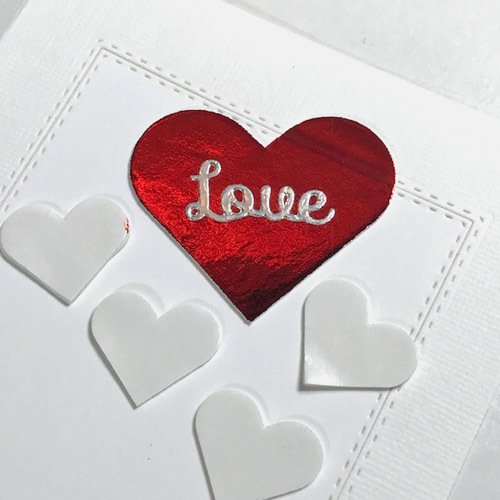 It is so easy to make these foil heart balloons! First I prepared a white card panel with stitched rectangle and then used E-Z Dots® Permanent Refillable Dispenser to assemble the layers. 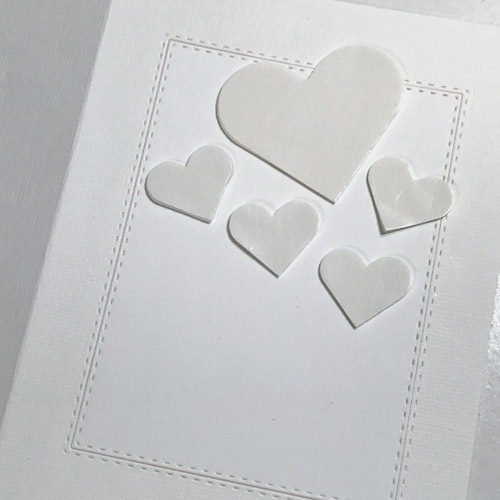 With a pack of 3D Foam Hearts, I placed one large heart and three medium heart shapes onto the card front. 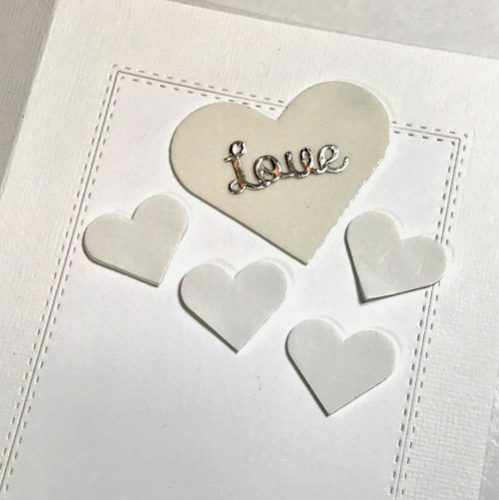 Next, I die cut the word “Love” from silver metallic paper (not cardstock). After I peeled the liner from the large heart and centered “Love” on top of the large heart but don’t press it down yet. 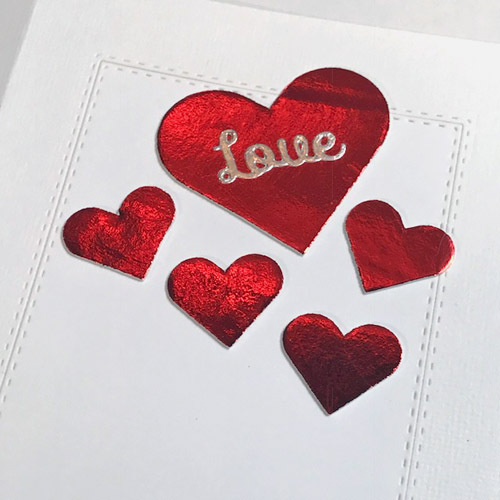 Make sure to peel one liner at a time with the medium hearts to make best use out of the foil application. To finish the card, I drew strings from the hearts with a black permanent pen. I stamped the verse with black ink. Happy Valentines’ Day (a little early)! This entry was posted in 3D Foam Shapes, Adhesives, Cards, E-Z Runner® Dispensers, Permanent Adhesive, Wear your Adhesive on the Outside and tagged 3D Foam Hearts, 3D Foam Holiday Embellishment Kit with Foil, Bazzill Basics Paper, Card, Card Making, E-Z Dots Permanent, E-Z Dots Permanent Refill, E-Z Dots Permanent Refillable, E-Z Runner Grand Dispenser, E-Z Runner Grand Permanent Dots Refill, IMAGINE Crafts/Tsukineko, Judy Hayes, Our Daily Bread Designs, Penny Black, Spellbinders Paper Arts, Tutorial, Valentine's Day. Bookmark the permalink. 2 Responses to "Love Balloons Card in Foiled 3D Hearts"